LINCOLN, RI (Dec. 2, 2010) – Ending a bitter feud that’s lasted a year, Dany “The Upgrade” Lauzon (14-4-0) only needed 1:54 to force rival Damien “The Omen” Trites into tapping out by way of a guillotine, headlining tonight’s “Snow Brawl” professional mixed-martial-arts card at Twin River Event Center in Lincoln, Rhode Island. 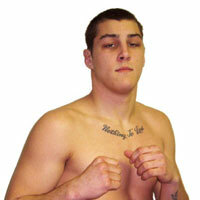 “Snow Brawl” was presented by Jimmy Burchfield’s CES MMA, in association with Twin River. Fighting for the first time in his home state, Providence light heavyweight Greg Rebello (12-2-0) won his 11th straight fight, taking all three rounds for a unanimous 3-round decision against Tiawan Howard (7-6-0) in the co-main event. In a spirited battle between talented bantamweights, Tateki Matsuda (5-3-0), fighting out of Boston by way of Tokyo, won a hard-fought, 3-round split decision versus a game Jason Bennett (4-3-0). In a pair of lightweight bouts, Hitalo Machado (7-4-0) won a 3-round decision against hometown favorite, Lincoln’s (RI) Jeff “Candyman” Anderson (5-3-0), while Luiz Rodriguez (4-0-0), of Somerville (MA), remained undefeated by locking a triangle choke on Lionel Young (4-5-0) for a win by first-round submission. In a fight featuring a pair of fighters making their pro debuts, popular Framingham (MA) middleweight Doug Bolanes blasted Josh Labossiere with a powerhouse right-handed punch that landed square on the jaw, set-up by a left uppercut, for an impressive knockout at 1:11 of the opening round. Providence favorite Ruben “Rukus” Rey (2-1-0), of Providence, stopped James King (0-2-0) midway through the second round, in a fight contested at a 152-pounds catch-weight, by way of a flying knee kick to the body followed by a strike to the head. The long anticipated pro debut of Waltham (MA) lightweight Tyson Chartier was a success as he forced Justin Switzer to tap-out from a rear naked choke in the third round. Go to www.cesmma.com for pictures and schedule of future events.